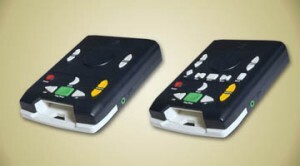 Individuals, places and libraries registered with the New Jersey State Library Talking Book & Braille Center (TBBC) are eligible to receive a no-cost, long-term loan of an easy-to-use digital talking book machine (DTBM). In addition, a TBBC member can have a collection of digital audiobook cartridges and access to download audiobooks and magazines from the Braille and Audio Reading Download (BARD) web site of the National Library Service for the Blind and Physically Handicapped (NLS), a division of the U.S. Library of Congress. Visit our BARD web site for more information. Questions? Call TBBC toll-free at 800-282-8322. Watch/Listen to an audio-described video demonstration of the very easy-to-use standard digital audiobook player available to those who apply for TBBC’s services. About the digital talking book machine: The digital talking book machine you will receive from TBBC is provided by the National Library Service for the Blind and Physically Handicapped (NLS), a division of the Library of Congress. It is on a long-term loan to you at no cost if you are registered with TBBC. You can listen to audiobooks in two ways on the player: on digital cartridges TBBC loans to you or you can download audiobooks and audio magazines from BARD to a flash drive. The flash drive can be inserted into the USB port on the right side of the player. From time-to-time, there will be software updates for the machines. Watch for software updates here. Models of the digital talking book machine: There are two models of the talking book machines and each model is easy to use. On both models, the buttons are large, each button has a braille label, and each button speaks to you. On the right side of the machine, there is a port for headphones and an USB port. If you would like to change the model that you received, just call TBBC at 1-800-792-8322. You can learn about the functions of each button of the player, with no books inserted, by turning on the talking book machine and touching a button; it will speak its function. Digital talking book machine will play music: You can also listen to music on your audiobook player. MP3 and RIFF WAV files can be downloaded to a clean flash drive (that does not have any other files on it). The flash drive can then be inserted into the USB port on the right side of the player. TBBC does not provide music. List of players that are compatible with TBBC’s audiobooks: The audiobooks provided by TBBC are produced by the National Library Service for the Blind and Physically Handicapped (NLS). 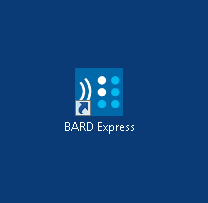 These audiobooks and BARD files will play only on devices authorized by NLS. Here is a list of these players. Step 1: Turn off player. Make sure the player is plugged into an outlet. Step 5: Press Fast Forward; then press Play. Player speaks Spanish. Step 6: Turn the player off. Step 7: Turn the player on and insert the Spanish book. Step 5: Press the Play button again. The player will now speak English. Step 6: Turn the player off and insert your English book. Returning equipment to TBBC: With each digital talking book machine we ship, we include a form for you to complete when you return the player to TBBC. On this form, please check off whether you need a replacement player or if you wish to cancel your service. Place this form in the box with your equipment to be returned. Please be sure to put your name on the form. You must call us at (800) 792-8322 or return the form included with your player to receive a replacement. Pack the equipment in the box or package it was received, securing it in place to prevent damage. To secure the player you can use crumpled newspaper, Styrofoam blocks, bubble wrap or any other material that will protect the equipment. If you no longer have the box in which your machine was received, any box you can find will do, as long as youve secured the player. Use the same Free Matter mailing card received with the player. Turn the card over so the hole in the card is positioned in the lower left corner, then insert the mailing card in the clear plastic mailing card pocket. Please do not write anything on the mailing card. If you do not have a mailing card, call our library to request one at 800-792-8322. Your package is now ready for the post office. There is no charge to return your equipment using this method. Turn the player on while simultaneously holding down the Tone Up, Rewind and Sleep buttons. To erase these errors, hold down the Sleep button for 5 seconds. The player will shut off. If you have followed all of the steps above and the player is still not working, it could be that the battery needs to be replaced. First, make sure that the battery is recharged by plugging the power cord, found on the back of the player, into an outlet. It takes approximately 2 hours for the battery to recharge. If the battery does not recharge, pack up the player and ship it back to TBBC following the steps described above in “Returning Equipment to TBBC.” We will replace the battery and return the player to you. When you you hear, “Creating a New Profile, the player is reset. Recharging the battery: To recharge the battery, plug the power cord (found on the back of the machine) into an outlet. It takes approximately 2 hours for the battery to fully recharge. If the battery will not recharge, call TBBC at 800-792-8322. Enjoy your new digital talking book player and Read On! You can always call TBBC with any questions at 1-800-792-8322.